Library image #3966: A young mountain goat lays against is mother among the alpine grasses. 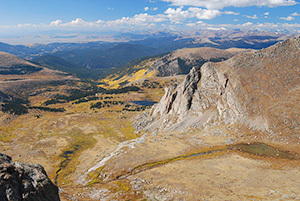 The United States Congress designated the Mount Evans Wilderness (map) in 1980 and it now has a total of 73,459 acres. All of this wilderness is located in Colorado and is managed by the Forest Service. Mount Evans Wilderness is located approximately 40 miles west of Denver. The Mt. Evans Scenic Byway ascends a non-wilderness corridor into the center of the Wilderness. The road, two 14,000 foot peaks (14,264' Mt. Evans and 14,060' Mt. Bierstadt), and the close proximity to Denver have contributed to very heavy use. Despite the likelihood of encountering other users, the area offers several unique features worthy of a visit. Evidence of past glaciers can be seen in the steep granite cirques and glacial moraines surrounding the high peaks. The Wilderness contains small regions of arctic tundra, rare south of the Arctic Circle. Unlike typical Colorado alpine tundra, which is dry and brittle once the snow recedes, arctic tundra holds numerous small pools of water. Vegetation ranges from lower spruce-fir and lodgepole forests, through 2,000-year-old Bristlecone pines and krummholz near treeline, to delicate alpine vegetation reaching all the way to the highest peaks. Deer and elk inhabit the sub-alpine areas, and bighorn sheep and mountain goats are common above treeline. Special protection for the Mount Evans area began 1956 with the designation of the approximately 5,880 acre Abyss Lake Scenic Area under the precursor of the Wilderness Act, the "U-Regulations" of 1939. This was followed in 1980 by the creation of the Mount Evans Wilderness under the Colorado Wilderness Act. Mount Evans is accessed by a 110 mile trail network, 84 miles of which are within the Wilderness boundary. Planning to Visit the Mount Evans Wilderness? How to follow the seven standard Leave No Trace principles differs in different parts of the country (desert vs. Rocky Mountains). Click on any of the principles listed below to learn more about how they apply in the Mount Evans Wilderness.